Joyous times as the latest edition of the the Warner Brothers' Looney Tunes Golden Collection has been released. This is Volume 6. Check out Volume 2 (or YouTube) for the classic Hollywood Steps Out. Me - I recommend that you buy the whole series. Looney Tunes are the finest of mankind's contributions to civilization, followed by the dishwasher and the snowblower. Word is that this is the end of the series, but not the end of the release of restored Warner Brothers cartoons to DVD. I certainly hope that is true. I'm patiently waiting for the official release of the "Censored Eleven". Any serious student of motion pictures is conversant with the writing of the late James Agee, whose criticism of the industry and its artists was merciless, intense -- and completely on the mark. 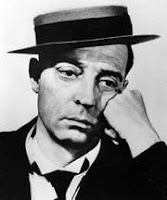 Yet there was one on whom Agee consistently showered praise: Muskegon's Buster Keaton. "No other comedian could do as much with the dead-pan," Agee wrote of Keaton's comic genius for Life magazine in 1949. "He used this great, sad, motionless face to suggest various related things; a one-track mind near the track's end of pure insanity; mulish imperturbability under the wildest of circumstances; how dead a human being can get and still be alive; an awe-inspiring sort of patience and power to endure, proper to granite but uncanny in flesh and blood. Everything that he was and did bore out this rigid face and played laughs against it. When he moved his eyes, it was like seeing them move in a statue." Agee continued: "His short-legged body was all sudden, machinelike angles, governed by a daft aplomb. When he swept a semaphorelike arm to point you could almost hear the electrical impulse to the signal block. When he ran from a cop, his transitions from accelerating walk to easy jogtrot to brisk canter to headlong gallop to flogged-piston sprint - always floating, above this frenzy, the untroubled, untouchable face -- were as distinct and as soberly in order as an automatic gearshift." This weekend is your chance to either discover the great Keaton, or to rediscover his silent film-era brilliance. In conjunction with the 14th Annual International Buster Keaton Society Convention of his fan society, the "Damfinos," two of the comedian's biggest box-office smashes will be returning to the screen at the Frauenthal Theater in downtown Muskegon this weekend: "Battling Butler (1926) and "The Navigator" (1924). The 8 p.m. Saturday shows will be accompanied by the theater organ performance of Dennis Scott, so the experience will be like that of any theatergoer of the 1920s. Should be a real treat. And welcome back, "Damfinos," to Muskegon, adopted hometown of Buster Keaton! Agee's article entitled "Comedy's Greatest Era, appeared in the September 5, 1949 issue of Life. It was the beginning of a new beginning for Keaton. Only months before, he had returned to Muskegon, accompanied this time with his new bride, Eleanor. Nearly forgotten in Hollywood, the article marked his return to the public eye. Television would soon offer a new audience and new generations of people that could witness his talent. Before long, Keaton was as busy as ever. In 1958, Columbia University's Oral History Research Office captured several lengthy interviews with Keaton about his life and career. They are available online, and are well worth checking out. of history to the entertainment we see today. Well, another Keaton Weekend is nearly complete. Just a few more items to attend to then work begins on 2009 - the 15th annual convention. The Damfinos are headed home. Some East, some West, some North, others South. A few will cross defined borders of countries. One couple, who met here, then married here one year ago, will cross an ocean. They are, as the bride GraceAnn describes them, all part of the "Dam" family; Keaton fans celebrating the work of their favorite family member. This year, we got to meet many who were making their first trip to the family reunion. Here's a "team photo" taken at the baseball field where Buster learned to love the game. Many of the group joined me for the walk through the neighborhood. Still more arrived on Saturday. Friday's viewing of the mystery film - "Hospitality" (no - that's not a typo) I'm sure will be discussed in great detail on message boards across the internet. Saturday's talks, auction, and presentation of Battling Butler and The Navigator were met with laughter, joy, applause and standing ovations (Organist's Dennis Scott's performance for the films was incredible! - He even made MGM's lion roar!). Hope you had the chance to partake in at least part of the festivities! It was, as always, a blast! Check out the Detroit Free Press for more on Keaton. This article includes a quote from Patty Tobias, president of the International Buster Keaton Society, discussing this weekend's events. 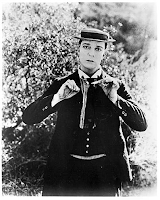 The great debate over who was the best silent comedian -- Charlie Chaplin or Buster Keaton? -- has raged for nearly a century. If the number of recent screenings at the Michigan, Redford and Detroit Film Theatre is any indication, then Keaton, known as "the great stone face" for his expressionless delivery, wins hands down. This weekend also marks the annual convention of the Keaton-crazy Damfinos, held each year in Muskegon, on the west side of the state. Why there? Because Keaton's family, along with other vaudeville acts, made this a vacation home each summer. Check out Chicago Public Radio's Eight Forty-Eight program for the audio story on Keaton's midwestern roots. When you think of silent films, the iconic Charlie Chaplin may come to mind. But true film fans know that Buster Keaton joins him as one of the most important silent film actors of all time. The great stone face was known for his wildly acrobatic maneuvers. What is less known is that his formative years were spent in Muskegon, Michigan. Keaton’s childhood was spent touring with his family on the vaudeville circuit. But his summers were spent at an actor’s colony in Muskegon founded by his father. Follow this link for the slideshow that displays images of some of the sites talked about in the program. A great feature of the Google empire is their new venture to organize newspapers and move the content to the Internet. Check out this article from the Cloverdale Reveille. It is a wonderful example. The article highlights Buster's granddaughter, Melissa Talmadge Cox, and her effort to keep her grandfather's name before the public. Yes, that's Dustin Hoffman standing next to her. If it weren't for Google, what is the likelihood of finding such gems? Another site that I use on a regular basis is newspaperarchive.com. Too bad their content from the state of Michigan doesn't run deeper.